Macrame Holiday, Leisure Time Publishing, 1977. 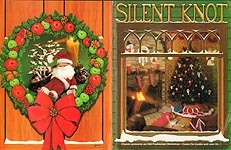 Patterns include: Jingle Bells, Rudy, Gobbler, Littlest Angel, Golden Angel, Tree Mail Pouch, Peppermint Stocking, Evergreen Tree Ornament, Holiday Spin, Snow- Fringed Stocking, Santa Cushion, Snowflake Wreath, Christmas Tree Fantasy, Snow Bells, Manger Scene, Candle Caper. Heavy cover wear; pages in good used condition. 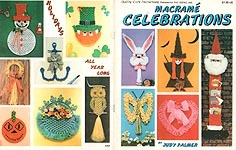 Macrame Celebrations, designed by Judy Palmer, Pat Depke Inc., 1978. Designs include: Yule Tree Ornament, Christmas Lace Ornament, Reindeer ORnament, Santa Card Holder, Santa, Christmas Elf, Bunny Fluff, Holiday Wreath Ornament, May Basket, Cupid's Mail Box, Valentine Heart, MerryMobile, Pandora Owl, Witch of the Midwest, Jack- O- Lantern, Christmas Tree, Snowman, Snowman withCard Holder Pocket, Anchors Away - two sizes, Christmas Owl Ornament, Mrs. Santa Ornament, Leprechaun, Pilgrim, Angelica Ornament, Picot Twist Tree Ornament, Christmas Mouse Ornament, Wreath For Any Season, Golden Glory Angel, Picot Bell Pull Ornament, Butterfly. Very good condition. 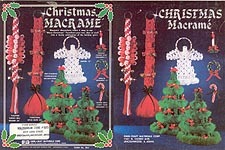 Christmas Macrame, Fibre- Craft, 1980. Projects include: Christmas Wreath Ornament, Crown Knot Candy Cane Ornament, Candle Ornament, Angel, Christmas Spice Rope, Sleight Bell Ringer, Self- Standing Tannenbaum Decoration. Store stamp on front cover, some wear. Inside -- very good used. 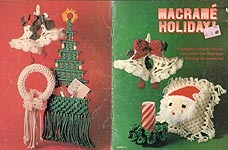 Merry Christmas in Macrame, designed by Vicki Waller, Handy "Craft-Pak Publishers, 1978. Wreath and Christmas Tree Card Holder to MACRAME. Good condition. 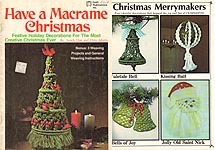 Have a Macrame Christmas, designed by Sandy Dye and Chris Adams, Craft Publications Inc., 1977. Projects include: Peppermint Vision Candy Cane, Merry- Making Kissing Ball, Bells of Joy, Jolly Old St. Nick, Yuletide Bell, Kissing Ball, The Christmas Flower Macrame Poinsettia, Deck the Halls Christmas Tree, Celebration Centerpiece (cornucopia), Merry Evergreens Necklace and Earrings, Holiday Ear Wreaths, Holiday Spread Placemat, Happy Noel Hanging, Chimneyside Stocking. Includes 3 bonus weaving projects and general weaving instructions. Heavy cover wear, but pages in very good condition. Knot Just For Christmas, Vol. 2, Classic Publications Inc., 1980. Projects include: Santa's Joy Wall Hanger, Fantasia of Bells, basket, Royce's Pocket, Suzy's Runner, Reece's Wreath, Musically Inclined Tote Bag, Doily Cover, It's Not Trash, Tissue Topper, Picture Frame, Button Button Cane, Naturally Macrame Wreath, Dreamy White Christmas Tree, Candy Cane Pocket, Christmas Door Pull, Baubles, Loop De Loop Basket, Shine On Star, Bell Ornament, Candy Tree Ornament, Bridget the Poodle, Puffy Star Ornament, Pretty Wreath Ornament, Wrap an Ornament, Tommy Cat, Garland. Many projects photographed in non- Christmas color schemes also. Cover wear, but otherwise very good condition. 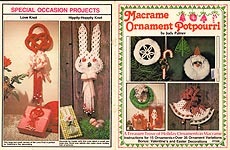 Macrame Ornament Potpourri, designed by Judy Palmer, Plaid Enterprises Inc., 1980. Projects include: Love Knot, Klockastrang Wrath, Whimsy Owl, Kandy Kane, Hippity- Hoppity Knot, Snowfluff, Tree of Lace, Jolly Santa, Squeaky Mouse, Key to Christmas Treasures, Hallelujah Bell, Guardian Angel, Klockastrang Wreath Ornament Size, Hallelujah Bell Ornament Size, Key to Christmas Treasures Ornament Size, Crown Prince Ornament, Holiday Tweet, Christmas Chapel, necklace strap for turning ornaments into keychains or necklaces. Definitely used and cover is detached from staples, but everything is here and in relatively good shape. Silent Knot (Macrame), designed by Karen Locke and Joane Grimsley, Classic Publications, 1979. Projects include: Amgel, Table Runner, Placemat, 3 different Belt Package Ties, Sleeping Santa, Basket, Mistletoe Ball, The Snow Knots, Santa Christmas Card Holder, Beaded Tree Ornament, Macrame Christmas Ornaments (3 top and 3 bottom ball cover designs that can be mixed and matched), Snowflake Ornament, Flair Bead Ornament, Tree Skirt, Raffia Wreath, Skating Mice, Bells for Door. Excellent condition; may smell slightly perfumey. Merry Christmas from Maxi- Cord, Maxi- Cord, nd. 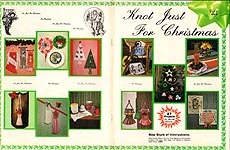 Patterns include Cavandoli Christmas Tree Card Holder, Noel Door Greeting, Maxi- St. Nick, Christmas Angels, Maxi- Cord Holiday Tree. Some cover wear, but pages in very good condition. 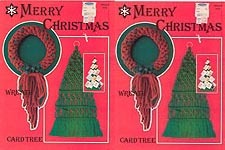 Holly Berry Reflections (Christmas Bells and Wordcraft), designed by Mary O. Henry, O Henry and Associates, Inc., 1980. Projects include: Kris Kringle's Candy Katch, Oh Joy Bell PUll, Noel Ribbon BellWreath, Christmas Corsage, Softy the Snowman Bell Ornament, Christmas Candlelight Bell Ornament, The Yearly Signing Wreath Bell Ornament. Tag smudge on cover, but othewise excellent condition. Holiday Trio, designed by Karen Locke, Classic Publications / ESP, 1978. Christmas Bells, Christmas Stocking, and Snowman. Good condition.